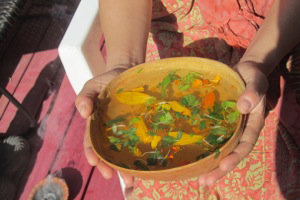 Holistic by its very nature, Maya medicine is classified as a medico-religious healing tradition, taking into account not only the physical ills of the body but also their effects on the spirit. The Maya recognize diseases of the soul as well as the body and are aware of the connection between spiritual and physical causes of illness. To learn more about the 4 main spiritual illnesses, click here. There will be several consultations with me via phone or email, prior to your Spiritual Bathing experience. Your bath is prepared before you arrive, then a one on one review session connects our intentions with what you have decided to release, manifest or shift. After changing into a sarong, you are seated in the garden as sacred copal incense drifts around you. This healing smoke surrounds your physical body, moving the curative experience into the subtle bodies, or energy fields. Ancient prayers, appropriate to your faith, are directed into the pulse points inviting the divine agents of healing into the sacred ceremony. Maya believe those prayers open the gates to the body, soul, and emotions and copal incense carries those prayers to heaven. Your moon infused water holds your plant allies, herbs and flower essences. All were gathered with gratitude, intention, and prayer to aid in bringing their specific medicinal powers to your bath. An aspersion begins with fingertips, bundled herbs or certain holy branches opening the door to your own bathing experience. Once the bath is completed, you sit in quiet meditation as integration takes place. This deep connection and new clarity allows the calmed mind and body to release, receive and express from a cleared subconscious level. You are led to the massage cabana for a 10-minute massage to push the healing to a cellular level, then receive a Tibetan singing bowl clearing, tea and light nourishment. Additional massage is available and highly recommended. A Spiritual Bath can be quite transformative, please allow yourself enough time to fully experience all the ritual has to offer.